I told her I’d just do my best, and she shrugged her shoulders at me and wrote out the picking permit. As soon as I pulled up to the orchard, I could see she hadn’t been joking. In just over 24 hours, the sour cherry orchard had been picked nearly clean. Grabbing my bucket and step ladder, I began to wander, hoping I’d find a few pockets of cherries left. I spent a bit over an hour out in the orchard, gazing at trees with an upturned head. I went up and down that step ladder at least 100 times, each time repositioning it to grab a bit more fruit. It was hard work, and yet it was also wonderful. All the stretching and bending, it felt like the most productive and delicious yoga I’d ever done. I went home that night with scant four pounds of cherries, which rapidly became three pints of jam. However a lucky thing happened as I was making the jam. I happened to broadcast my disappointment with the slim haul on Twitter. Some friends saw it and invited me to pick some cherries from the trees in their community garden, which happened to be dripping with fruit. With Angie’s help, I found myself with ten more pounds. Jams and pie filling galore! 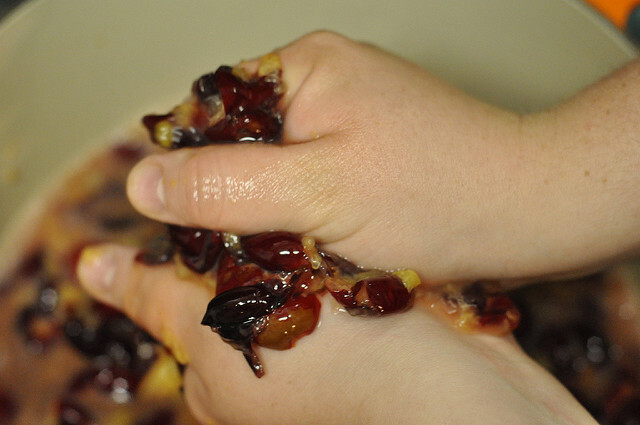 It might sound like I went to an awful lot of trouble for some sour cherries, but if you’ve tasted jams or baked goods made with little gems, you’ll know that the effort was well worth it. The flavor is bright, tangy (not sour exactly, just perfectly piquant) and, when combined with a bit of sugar, quite heavenly. I’ve been eating the jam stirred into plan yogurt (you might have picked up on the fact that yogurt is one of my favorite vehicles for jam) and I have six pitted pounds in the freezer, waiting to become pie filling at some later date – I plan on using this recipe as my starting place. Now, time is beginning to run out on sour cherries, but you can still get them if you look carefully. Here in Philly, Beechwood Orchards still has them (at least they did today at the Rittenhouse Market) and from what I hear, more northernly climates are just getting them in. Sometimes you can even get them frozen, which, if you’ve got a sour cherry tooth like I do, isn’t such a bad way to go. I do believe that it’s time to offer up another giveaway. This time, I only have a four ounce jar on offer (I’m telling you, this stuff is precious to me), but it should be enough to firmly plant the flavor in your taste brain and make you jones for more. Leave a comment by Friday, July 10 at 5 p.m. if you want a chance to win. One entry per person, winner will be selected via the random number generator. Put three pint jars or six half pints (or some combintion thereof) in your canning pot and bring to a boil. Combine fruit and sugar in a heavy, non-reactive pot. Bring to a boil and let bubble for a good twenty minutes, occasionally skimming the foam from the surface of the fruit as it develops. Add the pectin and boil for another five minutes. You want to cook it until it looks like boiling sugar - thick and viscous. Kill the heat, fill your jars, wipe rims, apply the lids and rings and process in the hot water bath for 10 minutes. Remove jars from water and let cool on the countertop. When the jars are cool (I typically wait until overnight), remove the rings and test the seal by picking the jar up by the lid. If it stays put, your jars are good to store indefinitely. I love the flavor of sour cherries, so I didn't add a drop of extra flavor to this jam. However, you are welcome to spice things up with cinnamon, nutmeg, cardamom, vanilla or orange (or anything else). Yogurt is just about my favorite vehicle for jam as well—especially anything with some chunk to it. One of my favorites is the Meyer lemon-vanilla bean marmalade I make. Love getting little bites of the peel. this looks amazing. do you think rainier cherries would work just as well? Oh yes, please put me in the running for the jam giveaway! Will you send the jar to Oregon?? 🙂 I have cherries in the freezer waiting to become crisp at a later date. YUM! 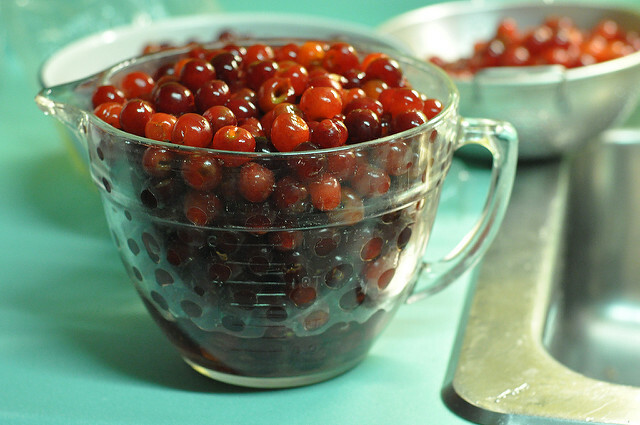 seadragon – a cherry pitter or two (it’s nice to have company when you’re pitting a lot of cherries) make baking or canning with cherries MUCH more enjoyable. My two cents: it’s a worthwhile purchase. I wish that I could find sour cherries here;all I could find were sweet cherries, but I made pies anyway. A cherry pitter is a must. I may have to try making some jam since this sounds so delicious. Wow, I’ve never had sour cherry jam. Now I am going to have to keep a lookout for a jar, it sounds fabulous. I also have only had sweet cherries. Mmmmm. This sounds incredible. 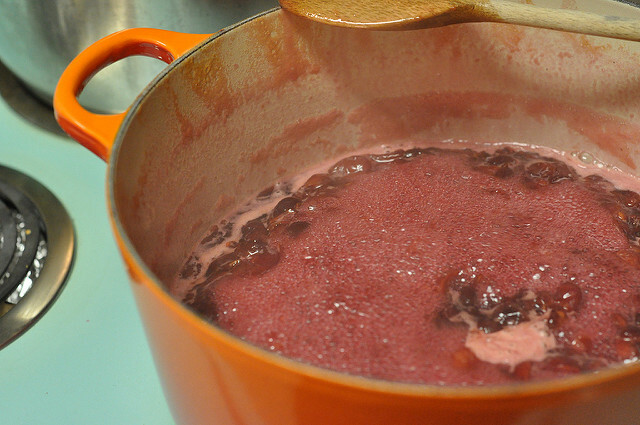 I recently had a strawberry – sour cherry jam that was one of the best things I’ve ever tasted… Thanks for the recipe. 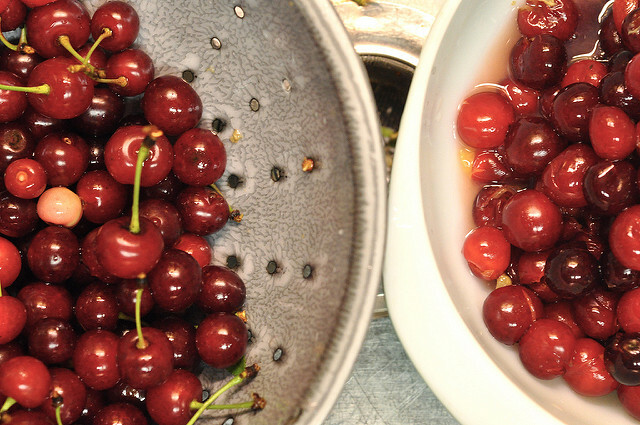 Behold the immense power of Twitter, magically transforming 4# in enought to satiate Marisa’s sour cherry yearnings! 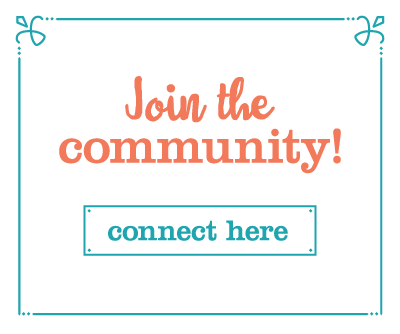 Count me in for jar giveaway ! 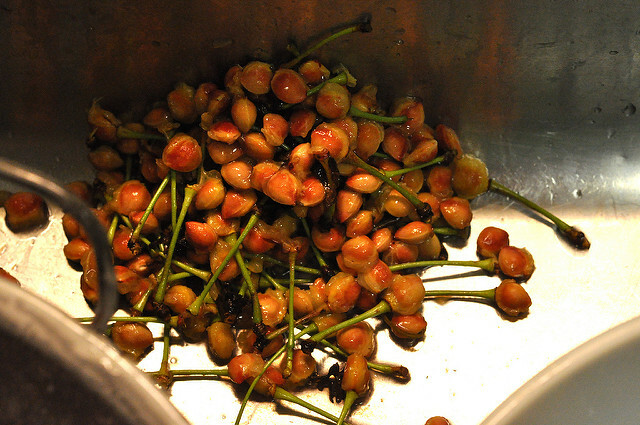 I love sour cherries sweetened and cooked til they are jammy…..and delicious! Great job, M! My favorite vehicle for jam is popovers! Me, Me, Me! I feel as excited as Tigger at the thought of sour cherry jam! mmm…sour cherries. i’m fairly sure we won’t find those fresh here in texas, especially in this heat! will have to settle for bings. i suppose i’ll need to cut the sugar. thanks! That looks divine. I love sour cherries but have never had them in jam. Mmmm, jam. sounds yummy….I add a plop of jam to my oatmeal, but my boys like pb&j oatmeal!….I’m in TX as well and we never see fresh sour cherries…but we have great peaches!!! If I don’t win can I interest you in a trade for a sweet cheery jam? or a cherry blueberry jam? I have been enjoying your site since I found you last month – I am finally making time to can again. I’ve done a series of no-sugar jams for my diabetic MIL this spring as the fruit has presented itself here in Oklahoma (more peaches from market this Saturday!!! ), and I’ve made some awesome pickles. The sour cherries intrigue me, and so a comment, so that I might win them! I pitted twenty pounds of sour cherries last weekend using the end of a large paperclip. It worked wonderfully quick! I have a hand-held pitter gadget for sweet cherries, which have a firmer texture, but soft pie cherries like those pictured are “ripe” for the paperclip technique. Yay cherries! 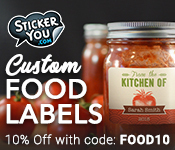 I just signed up for your tomato class at Philly Kitchen Share. Very excited for that! This jam also looks lovely, and I bet it tastes great on ice cream. My daily bowl of hot cereal is my jam vehicle of choice (though a slice of toast with jam on the weekends is not something I turn down). I don’t know that I’ve ever seen sour cherries down here in southern California. Perhaps I’m not looking in the right places? cherry jam always reminds me of my great aunt’s–it was such a treat to get hers. it helped me to fall in love with cherries! I’ll trade you pineapple-lemon for a jar!!!! I scheduled months ahead to go out last weekend for sour cherry picking only to (cleverly) call up the Friday before and be informed that the season had lasted three days and there was absolutely nowhere left with sour cherries. So my friend with the passion for sour cherries (I don’t know I’ve ever tried one) dropped out, and the other two of us went and grabbed a full measure of black sweet cherries. But, still, I am curious, and I would love to give the jam a try. I’d even share it with my passionate friend – he’s cute. My grocery store seems to never have liquid pectin in stock, leaving me with either regular powdered or sugar-free powdered varieties. Can I substitute these, and if so, how should I substitute them? Also, a neighbor who is a bit of a packrat gave me all of her old canning stuff, including some jelly jars with mason lids from what looks like the early 80s. Do mason jar lids go bad with time, even if they’ve never been used? 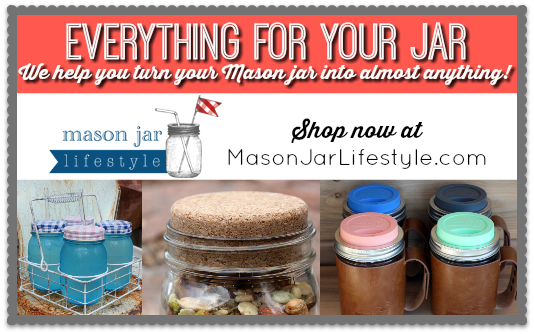 The jars themselves are pristine, 12 oz jelly jars, which look perfect for drinking from or storing jelly. Ohh, yum. I have no idea if I can pick my own sour cherries out here. But I’m gonna have to look into it now. That jam sounds yummy. I have my grandmothers old cherry oitter, a weird thing that screws on to the top of a ball jar. I love cherries in any format. I have been wanting to make jam and do some pickling but am not sure how to go about doing small batches…plus I am concerned about the whole killing myself and any others with badly processed items. When I get the nerve to start pickling I want to try a quick pickled cherries recipe I saw on Victory Garden. Oh, and please sign me up for the jam giveaway. Thanks! Those are some luscious-looking cherries! I love the sour-sweet combination. Yum!!! We’re enjoying your Strawberry Vanilla Jam recipe here. I love your site! I hear you—these things are PRECIOUS. I bet the jam is delicious. I love experimenting with new flavors of jam (such as the ginger peach jam I made a little while ago), but sadly, I’ve not had such a batch of cherries that I wanted to part with eating them fresh. You’re lucky to have had somewhere to pick them that hadn’t been thoroughly picked over! Ooh, I’d love some sour cherry jam! They’re hard to find around Oregon, but I’ve been looking. Oooh! I’ve never had a sour cherry, but have read about them. I would love a jar to try! That sounds so good. Never tried a sour cherry, but I think it’s about time! What can I say, I love cherries! Sounds yummy! You are inspiring! Yogurt is also my favorite use for jam. I discovered it one day when I had some peach jam that didn’t set. I wasn’t sure what to do with it, so I stirred it into my yogurt. Yum! My neighbors have a sour cherry tree . . . hm, wonder if I should broker a trade agreement – fruit for jam? It looks lovely and would be an amazing taste of summer in the bleak days of winter. I’ll have to try this – thanks! All those additions sound yummy! Cherry jam is one of my all time favourites! I’m in love with sour cherries this year too. I made a sour cherry, blueberry and sour cream cake with them last weekend and the cherries were definitely the star! I just love this site of yours Marisa. Great stuff. Wish I had realized you were doing it earlier, but I’m glad I know now. I’m glad to hear so many other people enjoy cherry jam! Thanks to your post, I’ve decided to go cherry picking here in CT and try some of the homemade goodness for myself! That jam is absolutely delicious!!! I did go ahead and get the liquid pectin, and made your recipe… Delicious!!! I made your jam, and started some cherry cordial, do you have any ideas for the rest? Have you tried drying them ever? (but I don’t have a dehydrator…). Any ideas are much appreciated! Hmm. Honestly, when I get to that point with cherries, I just pit and freeze them, and assume that I’ll figure out some other use for them later in the year. I don’t have a dehydrator, so I’ve never tried drying cherries. If you’re curious about that though, I’d suggest taking a peek at http://www.dorisandjillycook.com, Doris often dries fruit so she’s got some helpful advice. We are making a batch right now! Door County, Wisconsin is having the best cherry season every. I’ve got 2 pounds steeping in vodka, 4 pounds being made into jam. 5 or 6 pounds in the freezer and about 2 cups for breakfast in the morning. I made a batch of your cherry jam last night (our cherry season is late). I used half a packet of powdered pectin and it worked just fine. Your recipe was easy to follow and yielded excellent results. Thank you! So I’m looking at the picture with your hands, and I’m wondering whether I have to worry about the skins at all. Or will it all just end up smooth and tasty? Would lime be too strong a flavor to add? I ended up not using as many as I’d planned in the rhubarb chutney. Marisa, I find that cherry pitters decimate the fruit by pushing the pit through the entire fruit. I go the low-tech route with a closed safety pin. I boil the safety pin to make sure it’s sterile and once it’s cooled, it’s ready for use. The swirled end of the safety pin is inserted into the cherry at the site of the stem and I can extract the pit by pushing it back out towards the point where the stem was. The integrity of the fruit’s shape is maintained, less juice is lost, and it’s quicker than any pitter I’ve ever come across. Working on this jam as we speak! Im so excited to have found a recipe that calls for less sugar than most. I love sour cherry jam. Bought a couple little bags at a farmers market and then a dear neighbor brought over four baggies full. I have enough for a recipe and a half! Cant wait to taste it! How mashed is “mashed”? I can only see a little of the consistency in the photo so I’m guessing at it and going by how chunky I want the final result to be. Hope that works okay (in terms of creating cooking surface by breaking down the cherries). Quick question for you (hope you can answer it). My mom just picked up 20lbs of frozen sour cherries, but since our regular place wasn’t open she had to buy from somewhere else, and they already have sugar added to them. Apparently the bucket says net 10lbs, 1lb sugar (so 9lbs of cherries and 1 lb of sugar). How do you think I should go about compensating for this in my recipes? Obviously acidity and sugar for preservation shouldn’t be an issue, so I’m not worried about spoilage, but I worry that I will over-sweeten. Any suggestions? I have the honor of having my very own cherry tree in my yard. Just harvested 8 pounds last night. I’m making jam today! Usually, I dry them and make pie filling. The birds are eating my cherries as we speak but it is a holiday weekend…. Wow, I have been thinking of putting in a couple trees. Did you plant yours and if so how long did it take for the tree to produce fruit? Sour cherry rhubarb pie is my favorite thing to make with sour cherries. I just picked up a 10 lb container of pitted sour cherries. I will make one batchof jam and then freeze the remainder for pies. HHHHEEEEELLLLPPPPP!!!!!!! I tried this as well as a strawberry jam this year using liquid pectin and I can not get it to set up. I now have a case of chunky strawberry & sour cherry syrup. What have I done wrong. This is my 1st full season of preserving and 2 of my biggest projects have produced sub par products. Jeff, did you use the Certo liquid pectin? I’ve found that it doesn’t work as well as it used to. It could also be that you needed to cook it a bit longer, the times quoted in the recipe above are approximations. Cooking time can vary depending on the amount of water in the fruit, the width of your pan, the humidity in the air and the intensity of your stove. If you are really unhappy with the jam, you can take it out of the jars, recook it with a bit more pectin and rejar it. So sorry that it didn’t set up for you! I never have good luck with liquid pectin. I either get concrete or syrup, rarely hit the sweet spot for jam. I now try to find recipes that do not call for liquid pectin. I am a sour cherry addict. My mother in law gave us a tree when we moved into our house 8 years ago (Okanagan, BC, Canada) We live in orchard paradise. I got my best crop ever this year, about 12 lbs, and have been pitting/jamming/freezing for the last few days. Nothing is better than Sour Cherry Pie. BTW I barely use the pitter for my sour cherries as I can usually pull the pit and stem all at once. I feel spoiled to have a sour cherry tree in my backyard, it is over-producing this year! Going to give this a shot! Any recommendations for cognac/bourbon/boozy flavours to add to this jam? What about citrus zest or vanilla bean? Bourbon goes REALLY well with sour cherries. Thanks, Marisa. Goes it AFTER the jam cooks? I would think that otherwise it would evaporate off. What about cognac or kirsch? I have had sour cherry jam with kirsch and it was so, so good. Cherry Marnier (made by the folks who make Grand Marnier) is perfect in there too! Just finished making this jam. Didn’t add a thing and the flavor is amazing. 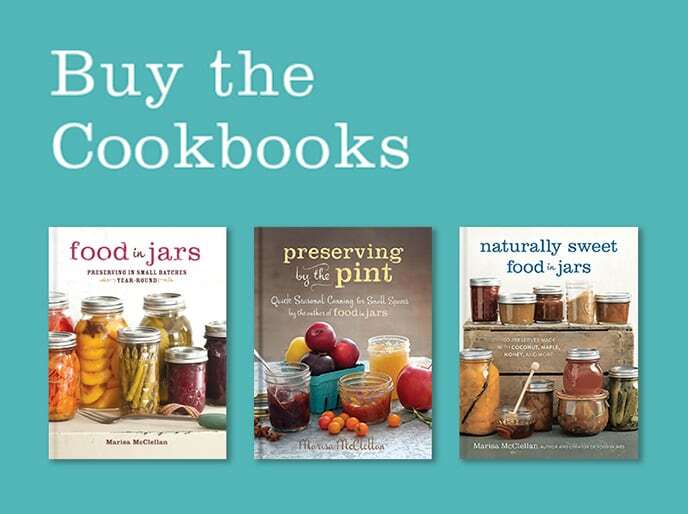 I’ve been using your book and website for a variety of recipes for jam, jellies, chutneys, etc. I have access to two very small sour cherry trees across the street from my house, open for the taking and just waiting (somewhat patiently) for the cherries to ripen. I recently made 4 x 125 ml of sour pin cherry and current jelly (along with a handful of raspberries picked from canes that escaped someone’s yard) and it turned out wonderfully. I recently made the switch to Pomona’s Pectin and found it works really well especially since I’ve wanted to cut back on refined sugar. Using raw sugar and honey has worked out nicely. 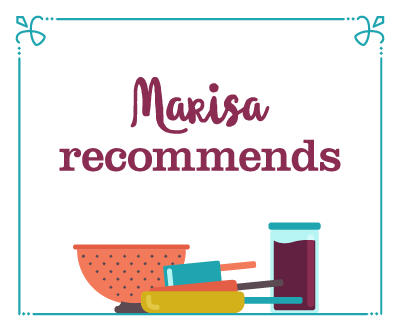 Thanks again for all your work on Food in Jars and I use it almost exclusively this year since I’ve had so many great results (the Roseymary Rhubarb jam is AMAZING – I am addicted to rhubarb now). Thanks for the recipe! I only had 5 cups of crushed sour cherries/juice and added chopped peaches to make 6 cups. Turned out beautifully! The sour cherry recipe that came with the pectin said 7 cups sugar and 2 pkg pectin for 4 cups fruit. Yours is much more to my liking. 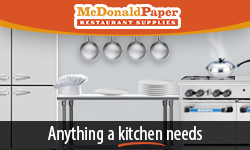 It must be the long cooking time that makes the difference. I cooked even longer for high altitude. Just out of curiousity, how do you get away with so little sugar? I know others mentioned it, but as I’m standing here, actually making this recipe, I’m realizing that all the other recipes online call for 7 cups of sugar to 4 cups of cherries and sometimes up to 2 packets of liquid pectin. Which…I think is INSANE! It’s still boiling, but from a taste test, I wouldn’t want it any sweeter. It tastes amazing already! I cook the fruit longer, am satisfied with a smaller yield and don’t worry if it has a softer set. I just found a hatful of sour cherries and plan to make jam. I never did it before however your instructions seem quite clear. Only problem no pectin! I heard u could make it without and then I had heard about using an apple? I’ll give it a try. Thanks for a great website. Heigh ho, cherry-oh time again. I don’t like using huge amounts of sugar either- I usually use Ball’s Low Sugar/No Sugar Pectin or Pomona’s, and put in about the same amount of sugar your recipe recommends. I don’t like cooking it too long, tho- maybe about half the time you use- tastes too “cooked” to me otherwise. Obviously I run the risk of having the odd batch not set up very well. but it’s a risk I happily take. May I suggest some almond extract as a last-minute addition, usually stirred in just as I take the jam off the stove. 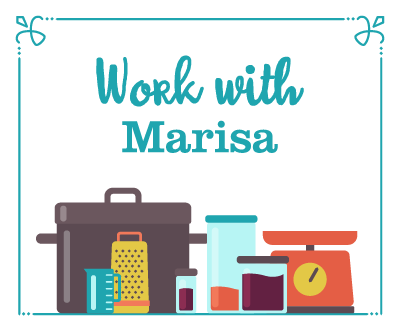 Hello Marisa, what a great giveaway. 🙂 I also have a question for you. I purchased some sour cherries today from a local orchard. The cherries are seconds or as the sign said day old. Some have blemishes on the skin. I tasted one and it was actually a little bit sweeter than the others. Have you used these types of cherries for you jam? My sister said she thinks it will make the jam look or taste bad.